From frequent reload bonuses and promotions, to first class customer service, Superbook has it all. Keep reading to discover more about this online sports betting company. Instead of offering a traditional bonus based on your deposit amount, Superbook gives all new customers a free bet when they place their first wager at the site. Simply create your free Superbook account, make a deposit of at least $50 (the minimum deposit) then place your first wager at the site, and Superbook matches it with a free bet of the same amount. They will match you deposit up to $100 and this free bet carries at 20x rollover requirement. Deposit options at Superbook are quite limited and vary from country to country. Visa is accepted, as is Bitcoin and several eWallet methods, depending upon your locale. For example, the eWallet option is not available to Canadian and U.S. customers. Money transfers are also available. Check with Superbook customer service at 1-800-996-5833 to discover which deposit methods are available to you. Part of the Sportsbook.ag family, Superbook is backed up with a vastly experienced management team and a customer service department that is available 24 hours per day, seven days per week. Superbook is one of the sports betting sites that offers literally hundreds of betting lines for major sports, in fact during the last Super Bowl there were more than 300 different bets that Superbook customers could choose from! The Superbook website design may not be the best in the industry, but it is certainly easy to navigate and simple to use. All of the different sports are located down the left-hand side of the screen, and clicking on any of them almost instantly open to those betting markets. The current welcome bonus at Superbook is a free bet up to $100. The smallest bonus you will receive depends on the first wager you place at the site, and with different sports and lines having different minimum bets, this can be as low as $0.10. The most you can receive in the form of a free bet is $100. Currently, Sportsbook.ag requires you to rollover any bonus or free bet 20 times. This is only five times for horse racing related bonuses, and 35 times for casino bonuses and promotions. In addition to matching your first wager, up to $100, at the racebook, Sportsbook.ag also offers up to 8% cashback on your racebook wagers regardless of you winning or losing. You receive 8% back on exotic wagers, and 3% cash back on your win, place, and show bets, with the refund happening automatically each day. This cash back is tied to a 5 times rollover, and the bonuses expire after 14 days of being issued. 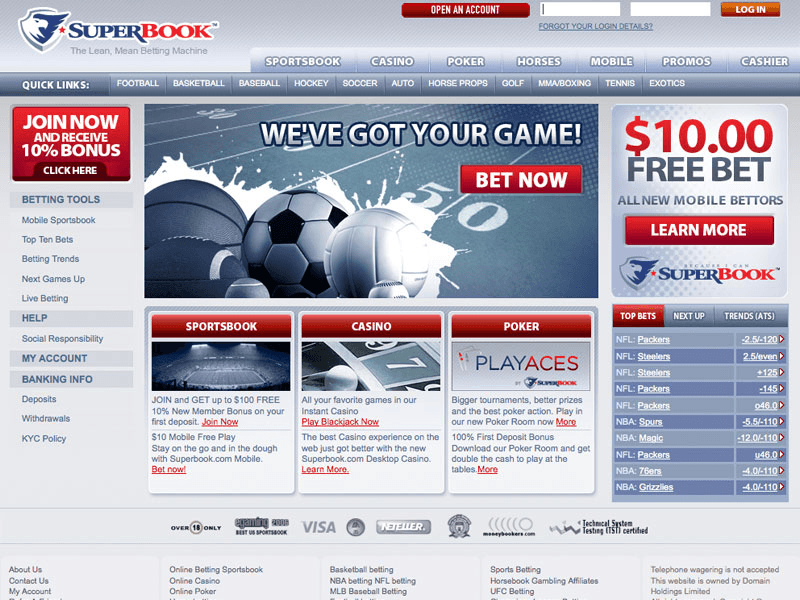 There are no betting codes required to claim your free bet of up to $100 at Superbook. All you need to do is make your first ever wager and the site will automatically credit your account with a free bet of the same value. Superbook offers a $50 casino match bet on your first wager, and you can enter a value-packed Blackjack tournament each week that features a $1,000 prize pool, plus there’s a special slots tournament every Friday that awards $500 to the top finishers. All casino bonuses are subject to a 35 times rollover, please bear this in mind when looking at any Superbook casino offers. On top of the 200 percent first deposit bonus up to $2,000 (use bonus code FIRST200PK to claim it), poker players can participate in tournaments that have combined monthly guarantees of $6 million, complete poker challenges for a share of $50,000, play via their mobile phone or tablet, claim frequent reload bonuses, and even compete in $500 freerolls. Cash games, sit & go tournaments, and multi-table tournaments are all available, and the best thing is you do not need to download any software if you do not wish to because it is possible to play for real money via your internet browser. Some of Superbook’s sportsbook promotions revolve around major sporting events, especially those from North American sports, so it is worth your time checking out the website closer to events such as the World Series and Super Bowl. One promotion that caught our eye was the $5 free bet you receive for every $25 wagered on your favorite team. Select your favorite sports team and whenever you bet $25 or more on them you receive a free $5 bet. You will also get a free bet worth 10 percent of your deposit every time you reload your sportsbook account at Superbook. The Superbook refer a friend bonus delivers to you 25 percent of your friend's initial deposit when they sign up and fund their new account. And you can invite as many friends as you want to join up, because there's no limit on how many times you can claim this promotion. Every week, you will get a chance to duble your winnings in the Superbook racebook via their Race of the Week and Race of the Day promotions. They offer more than $200 in double win bonuses each week. Every wager that you place in the Superbook racebook quailfies you for their daily cash back offer. You can get up to eight percent of your wagers refunded every day, whether you win or you lose.